Whether you live in Concord, commute on I-95 every day, or take Highway 3 through Nashua and Merrimack into Manchester, big trucks are everywhere. New Hampshire is a frequent route for interstate truck drivers supplying goods statewide and down the eastern seaboard. They also present additional dangers to passenger vehicles on both freeways and rural roads. Trucks bring us the food, fuel, and other things that make everyday life good here in New Hampshire. About 80% of the freight moved in the US is transported by big trucks totaling 10.5 billion tons of freight annually. Demand continues to increase meaning more trucks on the road and more chances for an accident. At any given point a big rig can be carrying groceries, medicine, household supplies, textiles, packages, as well as gasoline and other fuels, electronics and big machinery. Freight revenue is expected to increase 75% by 2026. In 2016, 3,986 people died in trucking accidents and 66% of those were in passenger vehicles. Most of the fatalities were in cars. Motorcyclists, bicyclists and pedestrians also fare badly in a truck accident. In most cases when a large truck collides with a vehicle and death results it is the passenger of the vehicle who is killed. More truck crashes that result in death involve tractor-trailers as opposed to single-unit trucks. When a a passenger in a large truck is killed in an accident it usually involved another large truck. Deaths caused by large truck crashes are more likely to occur during the day than other types of fatal crashes. Fatal large truck crashes are twice as likely to occur during the weekday as fatal crashes not involving large trucks. Drivers with a commercial driver’s license (CDL) are required to take extensive training to learn to drive large vehicles as well as qualify for the license. Most trucking companies have programs for their drivers emphasizing the importance of safety. Not speeding, getting adequate rest, and regular maintenance checks are some of their many requirements (as well as federal requirements). Police reports and other forensic tools can piece together what caused the accident, but it takes time. Trucking accidents are a lot more complicated than ordinary car accidents. The industry is regulated by the U.S. Department of Transportation (DOT) and the Federal Motor Carrier Safety Administration (FMCSA) on the federal level. At the state level, the New Hampshire State Police also have a Motor Carrier Enforcement Section for commercial vehicles. Cities and municipal townships may also have specific divisions that cover trucks and other commercial vehicles. When we begin building your case one of our tasks is to find out who is responsible. The driver may be an owner-operator and an “independent contractor” to the company that’s named on the side of the vehicle. As an owner-operator that company leases the vehicle from him or her. But the responsibility could also lie with the truck’s manufacturer, or the shipper (in the case of cargo not loaded correctly). Many of the companies whose trucks and drivers are involved in a crash in New Hampshire are based out of state making it even more difficult. While we may not be able to avoid an accident, it helps to understand road safety when driving near trucks to prevent one. A loaded big truck can weigh as much as 80,000 pounds so it’s important to be extra cautious when driving around them. If you’re behind two big trucks side-by-side and can’t pass be patient. Large commercial vehicles usually have speed limiters on the engines and can’t go above a certain speed. The one passing on the left is probably going as fast as the limiter allows and has to pass at the speed it can. Give big trucks plenty of room. Tire blowouts happen and if you’re too close to a loaded truck you may find yourself being hit by flying pieces. The driver may start swerving to compensate for the blown tire while getting to the shoulder. The same is true for other flying debris, even below 55 mph. Big trucks have large blind spots and the driver can’t always see you. Pass on the left and quickly—don’t take too long and don’t stay in the blind spot. Passenger side blind spots are bigger on a truck. Never follow closely behind a truck—they can’t see you, and a sudden stop can end with you crashing into the back. An 18-wheeler also takes very wide turns. Their turning radius is about 55 feet, so they need two lanes to make a turn in either direction. Again, give plenty of room, and don’t try to turn while they’re making a turn. If a truck has a signal on, don’t try to drive between the vehicle and the curb. A big truck weighing as much as 80,000 pounds at 65 mph needs at least 300 feet to be able to stop. Leave plenty of room between you and the truck, and don’t pull directly in front of a moving truck. The driver won’t have enough time to stop, and will result in a crash. Trucking companies have a job to do—drive. But when an accident threatens to cost a lot of money they have attorneys who will pull out all the stops to deny your claim, or reduce it. Don’t be a victim twice. They have lawyers who are on the case immediately—shouldn’t you have legal representation too? 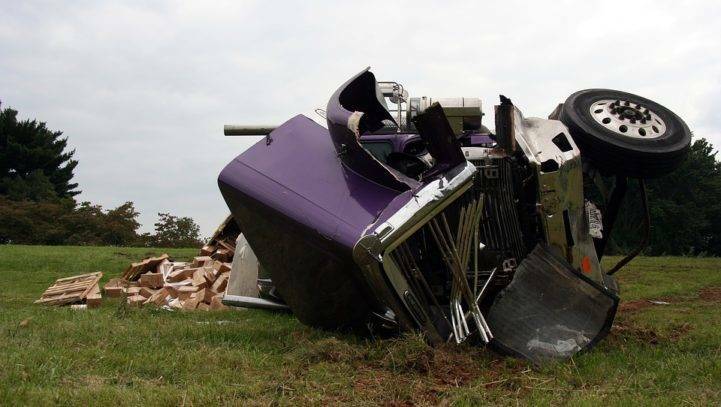 Trucking accidents have a lot more “moving parts” than a car accident. If you or a loved one has been in an accident with a big truck, and you need help, call Cohen & Winters today at (603) 224-6999 (or use our online contact form) to schedule a free 30-minute consultation to discuss your case. We’ll work to build your case, investigate the facts and fight to get your fair compensation for your injuries and losses. Our contingency fee arrangement means you won’t have to pay a fee until we win your case for you.